Creative IdeasThere are 8 products. Do you love art and creativity? Do you like creating different products? Free Sweets is a collection of creative articles, fimo tutorials and creatives ideas for jewelry making, beading and all other things that true creative people, like you are, love the most. Click on the gray button More details below and take a look at free video tutorial on How to make unique and beautiful Christmas tree decoration for your own christmass tree or your apartment. Click on the gray button More details below and take a look at free video tutorial on PAper Napkins Technique, which we used to decorade our crystal vase. Important! 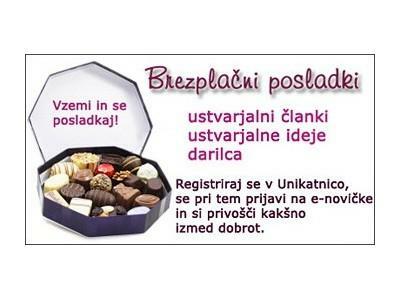 You need to be be registered/logged in to e-shop Unikatnica before adding this free tutorial to your cart. Creative tutorial: How to make Hello Kitty pendant - free on-line creative tutorial on how to make a pendant for children with Hello Kitty motif.